If you haven’t been following women’s swimming and diving, it’s about that time to make your approach. The Cardinals were already elites on campus, but they just upped the ante with a historic finish at the national level. 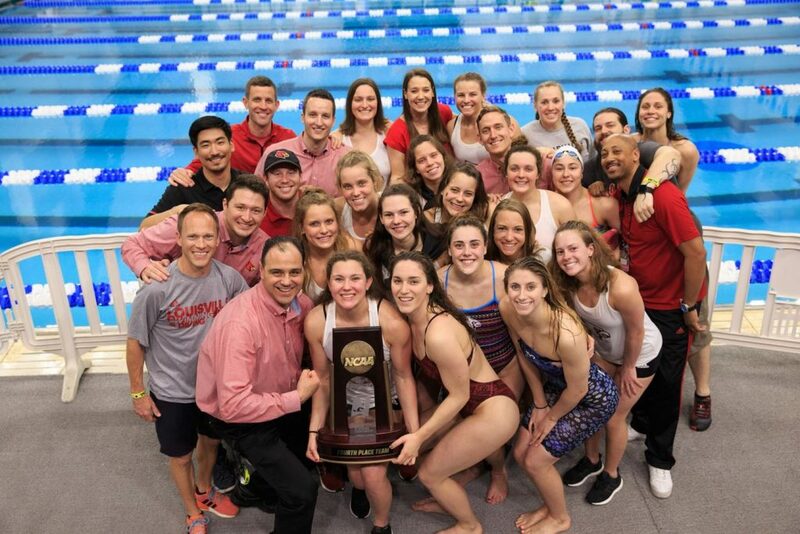 Louisville finished fourth overall at the 2019 NCAA Women’s Swimming and Diving Championships, marking the highest finish in program history. The team combined for 235 points, five All-American finishes, four record-breaking finishes, three medals and two national titles. Mallory Comerford stole the show and cemented herself as one of the most decorated student-athletes in school history. The senior won gold medals in the 200 freestyle and 100 freestyle, along with bronze in the 50 freestyle. With her third consecutive NCAA title in the 200 free, Comerford becomes the first three-time NCAA champion in a single event in school history. And with four NCAA titles across her career, Comerford steps on level ground with Olympian and former Cardinal Kelsi Worrell Dahlia for the most NCAA titles won by a U of L swimmer. Comerford shined at the NCAA Championships, and she was not the sole Cardinal to do so. Several performances are worthy of loud recognition, in addition to the team as a whole that topped its fifth-place finish from last year’s NCAA Championships. Senior Sophie Cattermole, Comerford, sophomore Arina Openysheva and freshman Alena Kraus combined for sixth place in the 800 free relay. The group earned All-American honors, tied the best NCAA finish in program history in the event and posted the second-fastest 800 free relay in Louisville history (6:56.07). Senior Alina Kendzior, sophomore Mariia Astashkina, junior Grace Oglesby and Comerford combined for fifth place in the 400 medley relay. Kendzior’s leg of the relay set a new school record, along with beating her own mark set at last year’s NCAA Championships. Kendzior, freshman Kaylee Wheeler, Oglesby and junior Lainey Visscher placed fifth in the 200 medley relay, posting the fourth-fastest time in school history. Another relay came with a record conquered and All-American honors earned. Visscher, Comerford, junior Avery Braunecker and junior Casey Fanz placed fourth in the 200 free relay for the best finish in school history. The group also broke the record for fastest time in school history (1:26.71). With 12th place on the platform, junior Molly Fears became the first diver in school history to earn Honorable Mention All-American honors. Oglesby posted the first top-three NCAA finish of her career with third place in the 200 fly. The junior’s bronze medal time solidified her as the fifth-fastest performer in history. The team of Comerford, Openysheva, Fanz and Visscher capped Louisville’s successful showing with fifth place in the 400 free relay. After finishing second at the ACC Championships, and ninth at last year’s national championship, men’s swimming and diving competes at the 2019 NCAA Championships from March 27-30 in Austin, Texas.